Viaje fuera del camino trillado en Belice con un recorrido en jeep por la selva tropical y una visita a las antiguas ruinas mayas de Altun Ha. Sube a la cima de una pirámide de piedra ceremonial y explora otros aspectos de la alguna vez poderosa ciudad precolombina con un guía, y luego aventúrate en la selva circundante en un viaje en 4x4 a una cueva aislada. Un picnic junto al río completa la emocionante aventura arqueológica. Subir a la cima de una pirámide ceremonial. Disfruta de un picnic en la ribera de Belice y de un refrescante baño. Incluye transporte de ida y vuelta desde el puerto de la ciudad de Belice. La expedición comienza con la recolección de la mañana en el puerto de la ciudad de Belice y un viaje al norte de alrededor de 1 hora para llegar a las ruinas de Altun Ha. Aprende sobre la historia de esta antigua ciudad maya que data de miles de años y es famosa por ser el sitio de descubrimiento de uno de los tesoros nacionales de Belice, una gran talla en piedra de jade del Dios Sol Maya. Explore las ruinas de palacios y plazas a pie, y suba a la cima de una de las pirámides ceremoniales más altas para disfrutar de fantásticas vistas de las llanuras costeras circundantes. Después de recorrer el sitio arqueológico, diríjase a la cercana ciudad de Hattieville y suba a un Jeep 4x4 para comenzar su aventura fuera de la carretera. Atraviese la aldea de Gracyrock y entre en la selva circundante, navegando por pistas escarpadas para llegar a una cueva remota. Después de explorar cautivadoras formaciones rocosas con su guía, relájese con un picnic de estilo beliceño junto a un río cercano, donde podrá darse un refrescante baño en el agua antes del viaje de regreso a la ciudad de Belice. We had an excellent time on this tour January 17, 2017. A very friendly guide named Jose met us at our hotel promptly at the time we requested with a big sign with our names on it. It was easy to find him and there wasn't any question about where we were supposed to be. 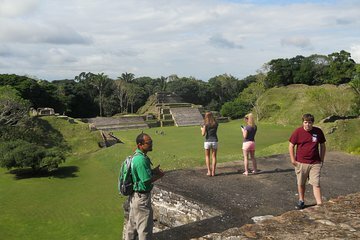 He then drove the four us in his spacious SUV to the Altun Ha ruins where he told us all about the history and culture of the site. Jose really knew his stuff! Then he drove us to his house where we got into 2 jeeps for the jungle part of tour we even got to meet Jose's wife and his two sons Jaden and Miguel. Driving through the jungle was very muddy with deep mudholes along with several muddy crossings as deep as the floor of the jeep. If you choose to drive it's best that you are skilled at driving in mud and pretty extreme offroad conditions. Halfway through we stopped at the cave entrance. Hiking up to the cave was steep and the opening to the cave was small but it was all worth it as we went into descended into 3 separate chambers of the cave and saw all sorts of stalagtites and stalagmites...and BATS! Be in relatively good physical condition to do this. Back at the jeep we finished the drive through the jungle then drove to a large but quiet pavilion for lunch which was already prepared and waiting for us. The local cuisine was outstanding and we could eat as much as we wanted. Marta the cook was wonderful! After lunch we drove back to the city and toured more of the downtown area. Jose was an outstanding tour guide. Not only did he know the city well he also taught us a lot about people of Belize, it's culture, its plants we even tasted a plant used for making allspice trees, and wildlife in the jungle. It was an exciting and unforgettable tour that I would highly recommend to anyone. It was well worth the price.